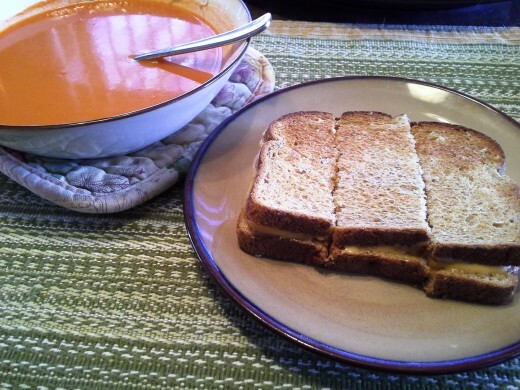 I know I say this in every one of my recipes because I love food, but I really do love grilled cheese sandwiches and tomato soup. 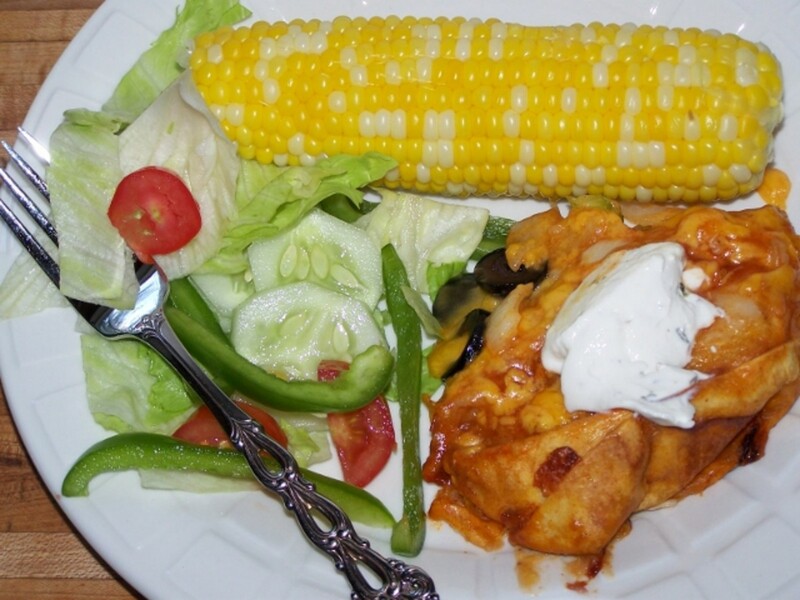 I think this is one of the classic meals that everyone has had at least once. 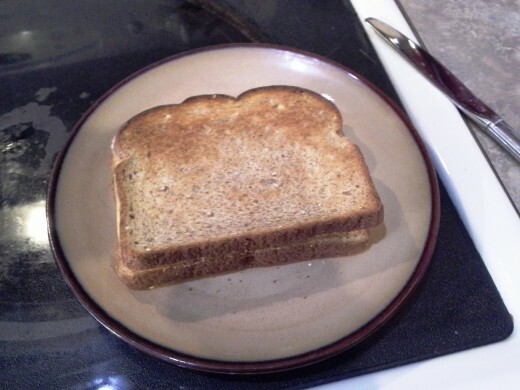 My mom and dad used to make these for me when I was little, but they would slather the butter onto the bread, stack on tons of cheese, and then use more butter in the pan. They were always so greasy I couldn't stand eating too much. In fact, I remember opening up my sandwiches and just eating the cheese out of them. 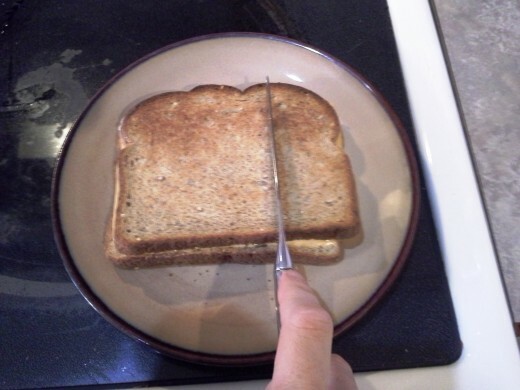 About a year ago, still craving grilled cheese and tomato soup at times, I was still putting butter on my bread, because I just figured that this is how it was done. 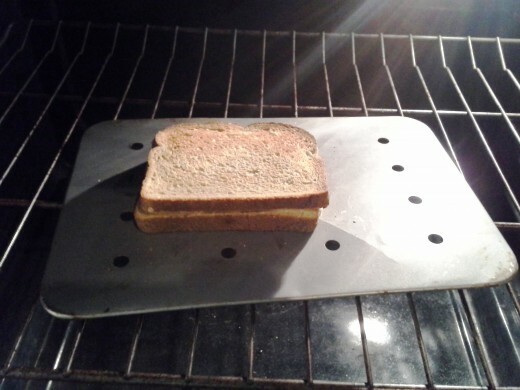 And then I tried making my sandwiches, still on the stove, but without butter. I tried cooking spray, olive oil, and even nothing. But they just weren't turning out too fabulous. 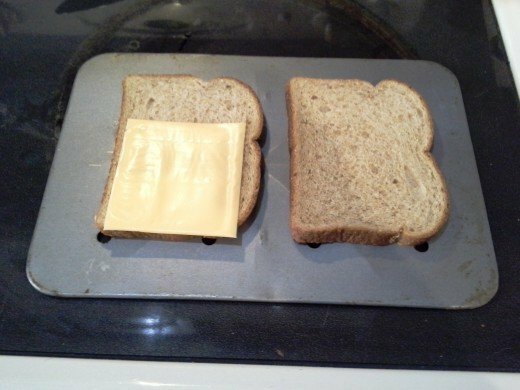 Finally, I tried broiling them, essentially just toasting the bread and melting the cheese, in the oven. Voila! I get all of the goodness of the wheat bread (I like to use wheat), and the gooey cheese, without all of the fat of the butter. Don't get me wrong, I love butter, but it definitely has it's time and place. I cut mine up into little pieces perfect for dipping, and dunk them in my tomato soup. Perfect! I wanted to share this amazing trick with you as well so you could enjoy them like I do now! Have fun! Prepare your baking pan. 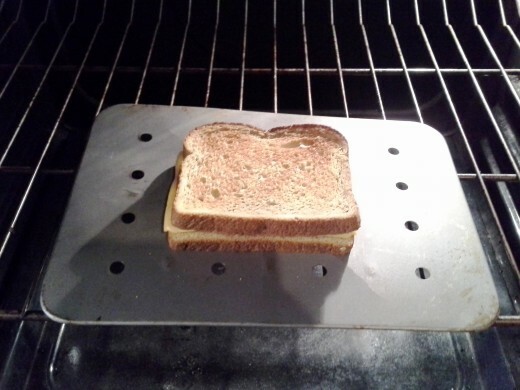 I am using my small simple little broil pan because I'm only making one sandwich. No cooking spray, no butter. 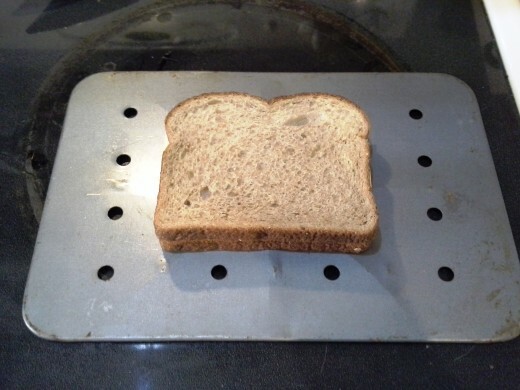 If you are making more than one sandwich, I would line a cookie sheet with aluminum foil, and still add no butter or cooking spray. 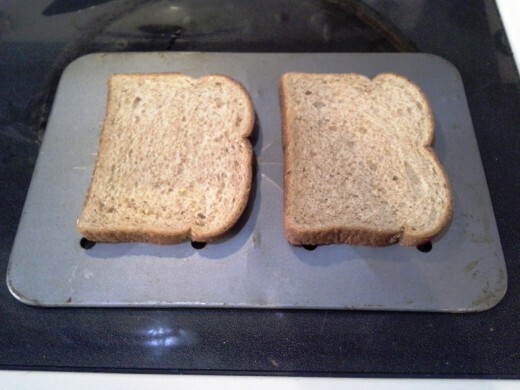 Lay your bread slices (2 for each sandwich you are making) out on your pan. 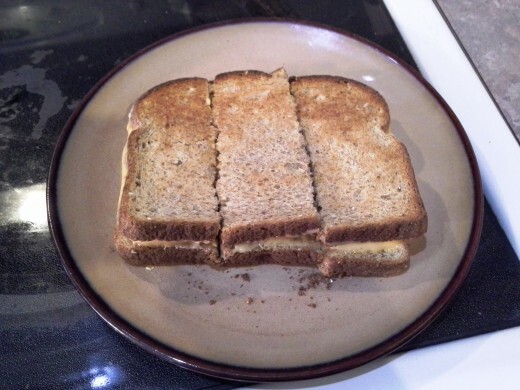 Lay your cheese slices on one bread slice for each sandwich. 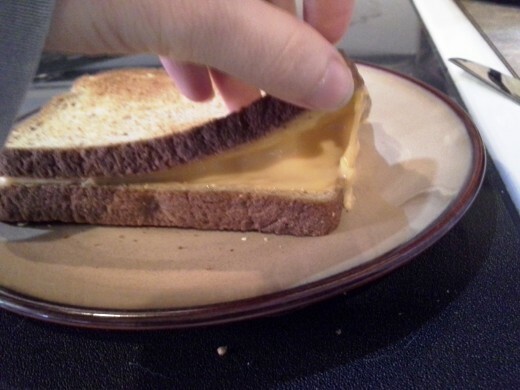 I lay one on each side so that the cheese will spread to the very edges of the bread. 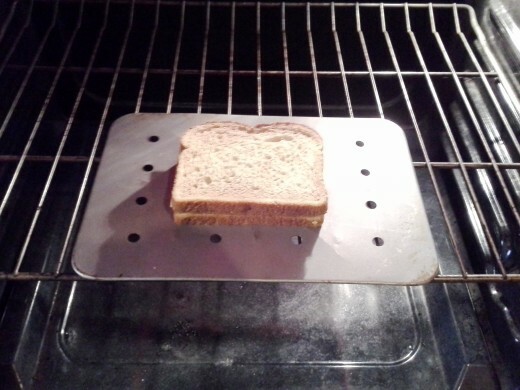 Lay your other bread slice on top and space your sandwich(es) evenly on your baking pan. Set your oven to low broil. Pop your pan in the oven and watch it closely. This will happen fast. 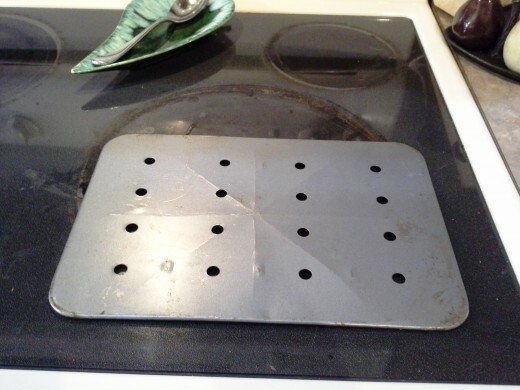 Once one side browns, flip it over with your hands. 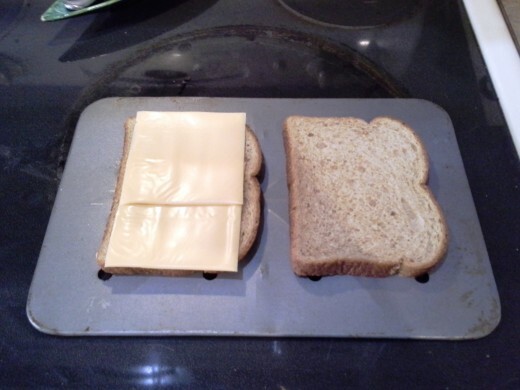 The other side will not be connected by melted cheese yet. 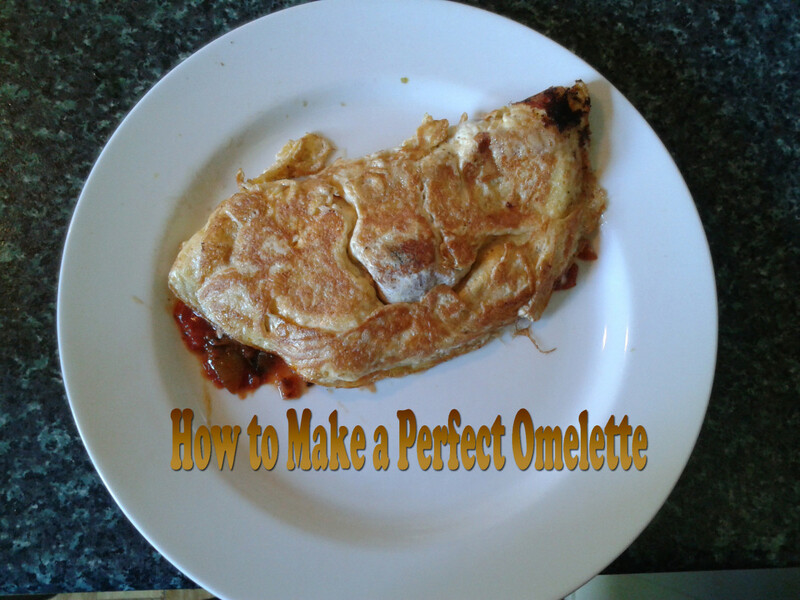 As the second side is browning, I press it down every few seconds to seal the melted cheese to both sides of bread. 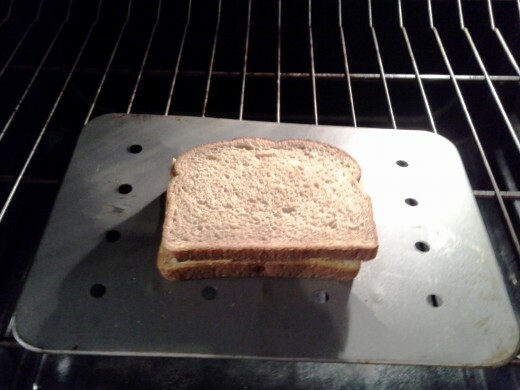 Once brown on the second side, pull out your baking pan with an oven mitt and transfer your sandwich to a plate. I like to cut mine into pieces and serve it with tomato soup. 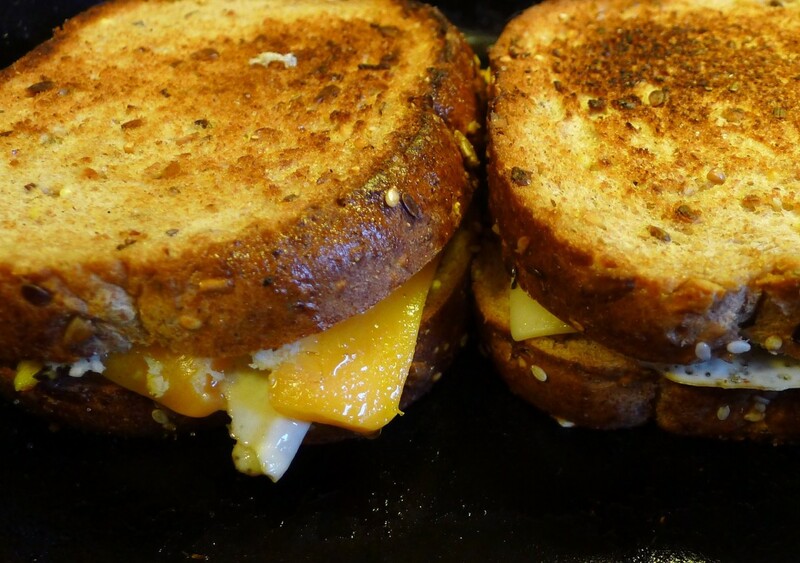 One great thing about these grilled cheese sandwiches is that you can add just about anything and make them totally your own. Some days I like to add tomato slices to my sandwiches to spice them up a bit. I've added ham for ham and cheese delights, spinach and tomatoes for an Italian flavored treat, and have even tossed in some of my favorite veggies for an even healthier snack for lunch. What I highly suggest is using my Easy Peasy Spinach Pesto Sauce for flavors you can't imagine, and that your children will love! I even use a variety of different dipping sauces for these delectable snacks. My favorite, other than tomato soup of course, is marinara sauce. But I've also dipped in Ranch, Hummus, and many other soups I've made at home. 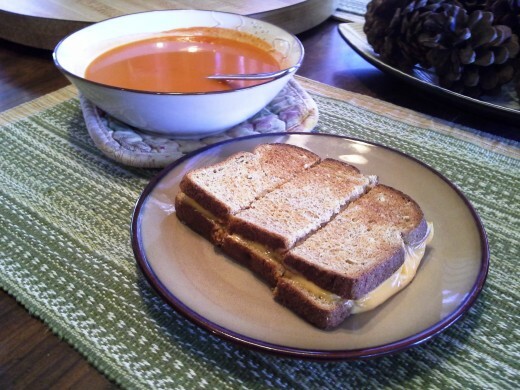 Although this is a super easy way to make a healthier grilled cheese sandwich, you can add in your own ingredients and make it that much better! Have fun, be creative, and enjoy!! It was very helpful! 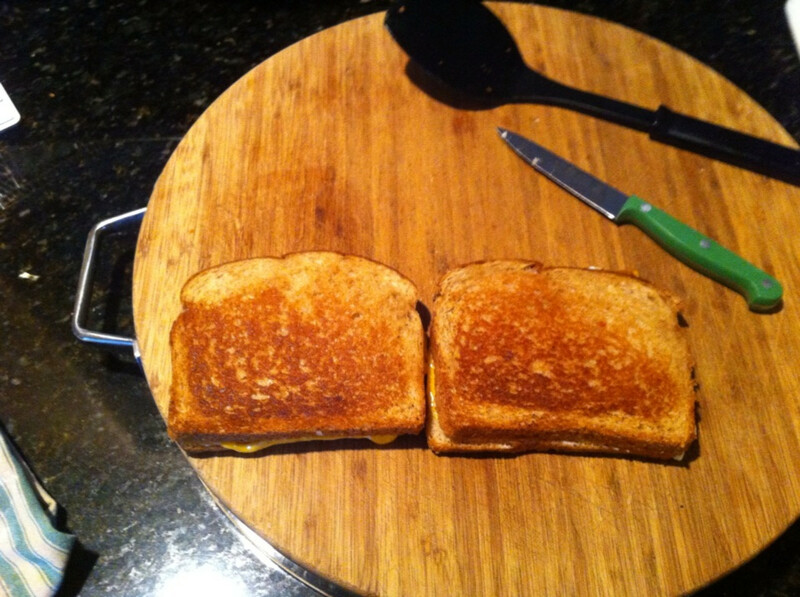 I didn't realize grilled cheese could be this easy. It was helpful. I may make a few changes to the recipe. Oh, I bet you that would taste amazing! Thanks for the tips! Me too! :) What do you like to put on yours? lol Very cute! I think I have broken all of the rules then, because we have this meal ALL the time! :) Anytime is a good time for cheese. Thanks I needed that. I had the same problem and now you fixed it. 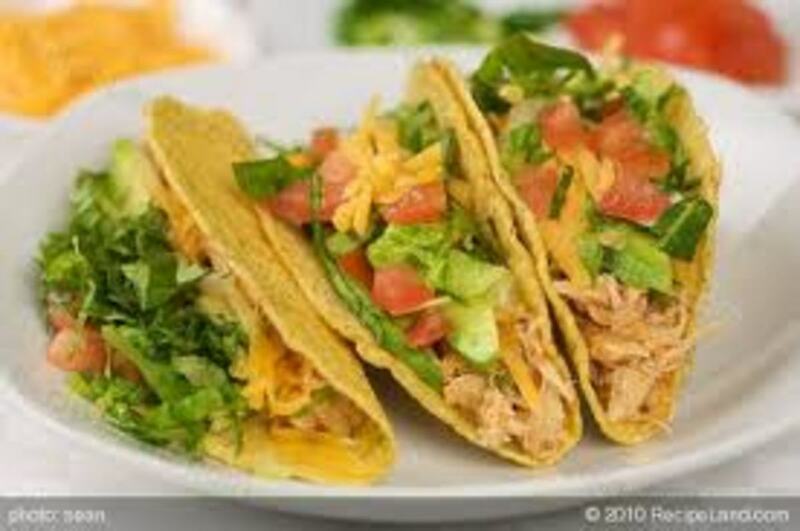 We will have them tonight. When I was growing up it was illegal to have this meal on sunny days, it was strictly reserved for rainy days. 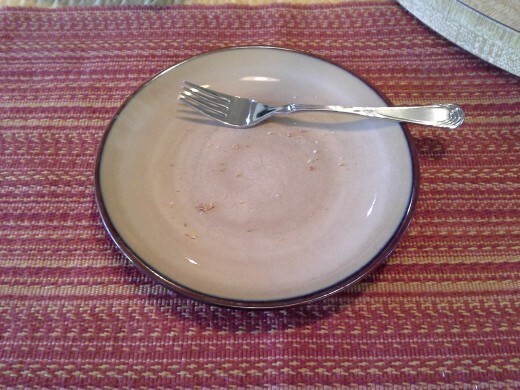 Lol Enjoy your grilled cheese sandwich Billy!